The moment I stepped into Bmon Café, I knew I would have a great time. It’s the aura that Bmon Café projects through its utterly dreamy and cute interior that greets everyone comfortably. There is just so much to see at Bmon Café. It’s like walking into a world of comical cuteness with much happiness in the air. Located in the less bustling area of Kota Damansara, Bmon Café is the brainchild of brothers Roy and Travis. 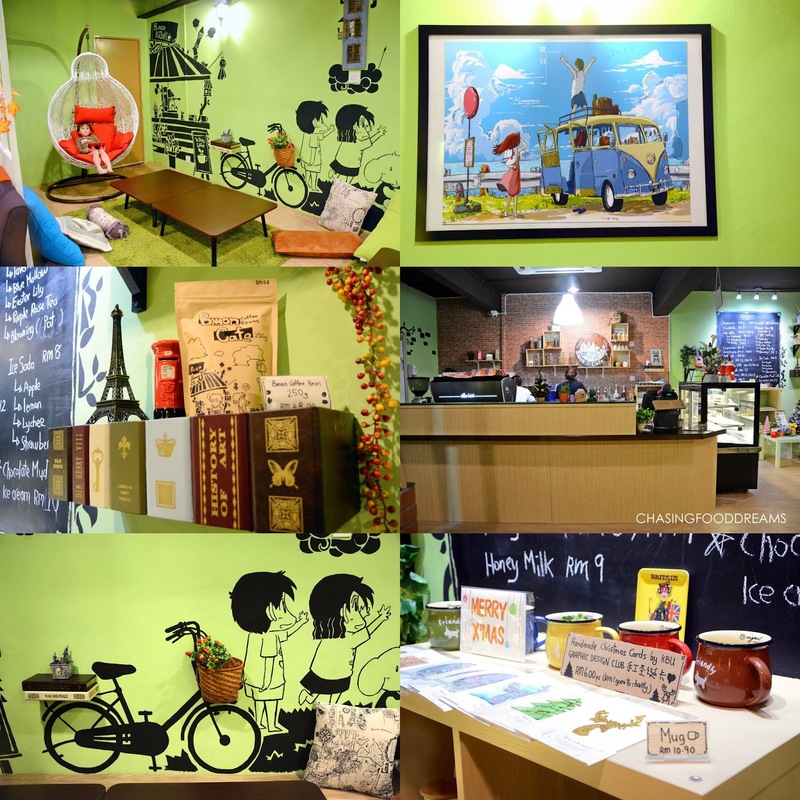 The café is named after a cartoon character Bmon created by Roy. Roy is also the talented artist that is responsible for all the paintings of Bmon in the café. Based on his favorite cartoon DoraEmon, Roy created Bmon which in chinese means 必梦. It means that that everyone should have a dream and go after it to make it come true. If you want to find out more about Bmon, check out their FB here. Bmon Café is quite discreet in location. It is located above the rows of shoplot at The Strand Kota Damansara. As soon as you enter the café, you will be amazed at how cheery and bright the café is. The café is very spacious with only handful of table seating. 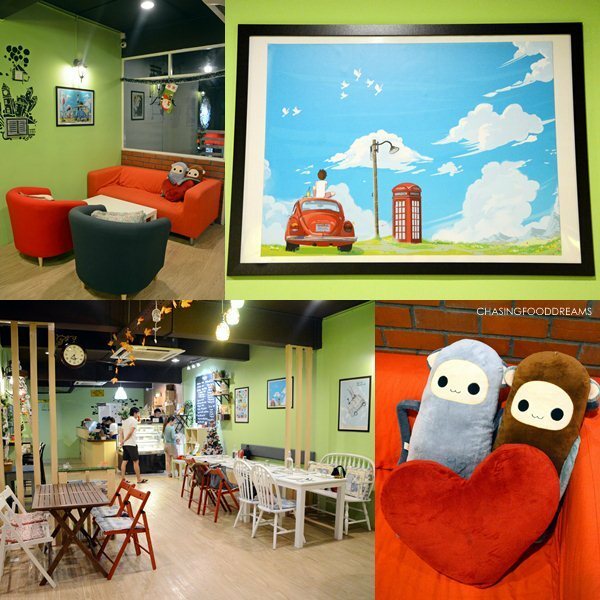 There is an area for sofa and low coffee table to chill out or there is another section where one can simply hangout on the floor seating at a very cozy room filled with pretty cool painting of Bmon and his friends. The floor has lots of pillow for comfort and there is even a swing chair which our kids enjoyed so much. 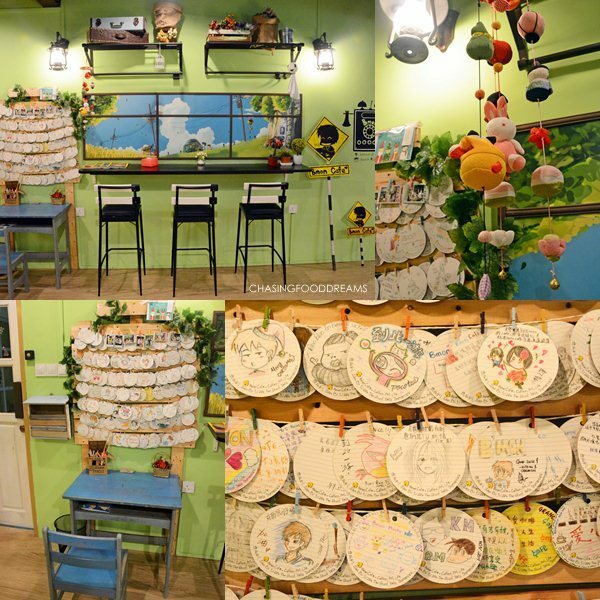 There is another section with two chairs and a wall painted with a tree hanging with lots of Bmon framed pictures. Lots of adorable knick knacks added charm. There is a long bar facing that room together with a chiller for cakes and cold desserts. I also liked the brick wall behind the bar with the Bmon logo on the wall. There is a lot of décor everywhere but it jives beautifully. Bmon Café makes everyone want to hang out there. The menu at Bmon Cafe is also fairly simple and very affordable. There are plenty of food and drinks to keep many of us adults and kids sufficiently happy. 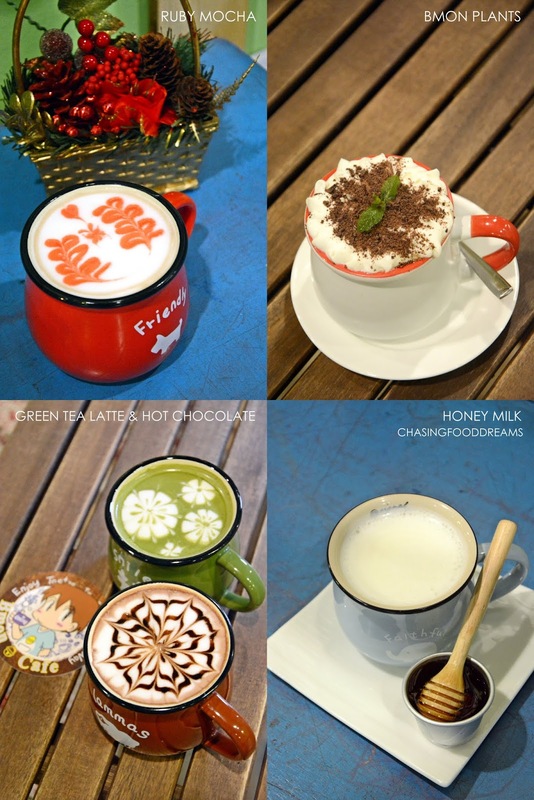 I like how all their hot beverages are served in their own super cute mugs completed with coffee art. You can actually buy their mugs and I was certainly tempted too! Hot beverages include coffee, tea and other beverages. We had their Ruby Mocha, Bmon Plants (RM13), Hot Chocolate (RM10), Green Tea Latte (RM11) and Honey Milk (RM9). I stole a sip of my little one’s Hot Chocolate and boy was it yummy with a good balance of cocoa and milk. For tea lovers, there are also flower teas and we all had their Purple Rose Tea (RM12 per pot). The gentle flowery aroma was soothing in the tea mix. 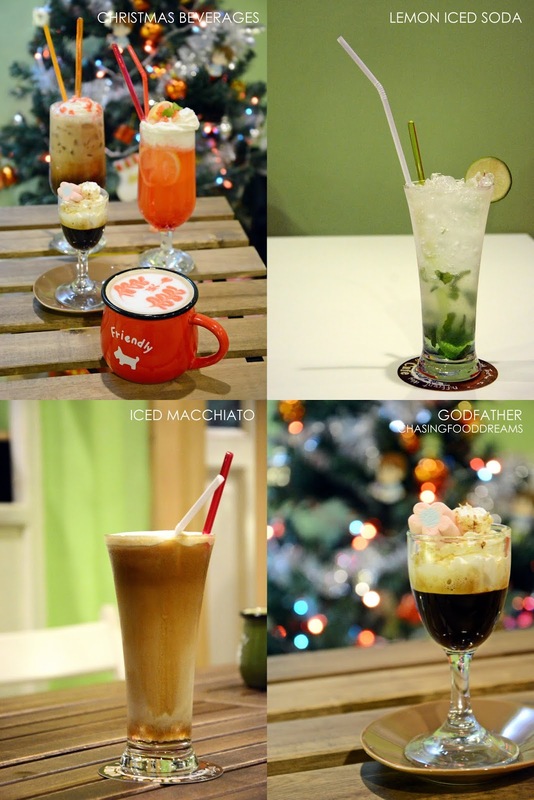 Since we were there during Christmas, we got to try their Holiday Beverages – Iced Ruby Mocha, Godfather & Lulu Berry. I don’t have the price for these but I do appreciate the creative festive drinks. Other cold drinks include Lemon Ice Soda (RM8) and my Iced Macchiato (RM8). The owners are really smart to offer simple housemade food. For now, there may be a limited menu but Travis and Roy is working on to add more later. Our salad of Fruit Mayo (RM10.90) is pretty good. It has lots of crisp greens with some vegetables, fruits, croutons and raisins all dressed in a light sweet mayo dressing. The All Day Breakfast Set (RM16.90) is delicious! For that price, it is certainly a hearty breakie of sausage, bacon, eggs, mushrooms, baked bean, hash brown, toast and a side of greens. Everything is well prepared and though there is nothing special about it, I would be happy with this plate anytime. It is just good classic prepared well. Bmon Café also has wraps and sandwiches to cater to those who enjoy light meals. Mushroom Wrap (RM12.90) and Tuna Wrap (RM12.90) are a lighter version since the tortilla wraps is less heavy than regular bread. The sautéed mushrooms is scrumptious with its soft earthy flavours while the tuna is creamy and tasty. One can opt for croissant for these and so we also tried their croissant sandwiches of Tuna Sandwich (RM13.90) and Turkey Ham Sandwich (RM14.90). I like the idea of using croissant as there is the added bonus of buttery pastry with the fillings. Pizza is also available and Bmon Café’s pizza uses tortilla as the base. Our Mushroom Pizza (RM13.90) and Hawaiian Pizza (RM13.90) are thin and crispy with a light tomato sauce, filling and sprinkling of cheese. As one can see, they are pretty generous with the filling. I thought the tortilla was a bit too thin to hold all the filling and I miss the bread base but its not significant since the filling is very delicious. Though Bmon Café does offer many choices of pasta but what they offered are classics and always everyone’s favorites. For less than fourteen ringgit, one gets a generous portion of hearty Chicken Mushroom Carbonara (RM13.90) and Chicken/Beef Bolognese (RM13.90). The pasta was cooked al dente to my liking while the sauces for both are light and hearty. I can taste the element of homecooking here. Enjoying this pasta won’t leave you with heaviness as the sauces are flavourful and light. The sauces also have lots of meat so the dish is quite filling. I would order the pasta here for its light and comforting notes. Hippo In a Pool (RM14.90) was one of my favorite dish that night. Serving only limited portions a day, the cutely coined dish is actually a crumbed and deep fried potato croquette served with hard-boiled egg, ham, crispy crab stick, corn, chicken floss, greens and a special cheese sauce. Looking deliriously fattening, I didn’t mind this one bit and tuck in happily. I really enjoyed the whole dish except for the egg which I felt was a bit odd in the dish. The creamy potato croquette went very well with the cheese sauce and I kept going back for more. Desserts it seems are also Bmon Café’s forte. We had their Waffle with Ice Cream & Fruits (RM12.90), Waffle Sensation (RM14.90) and Chocolate Mud with Ice Cream (RM10). The waffles are good! If you wish to come here just for coffee and waffles, I would highly recommend it. The crisp waffles are eggy and aromatic. There are quite a few toppings so pick your favorite. Ours was good with the ice cream and fruits. The chocolate mud with ice cream is also very good and comes with a chocolate painted Bmon! 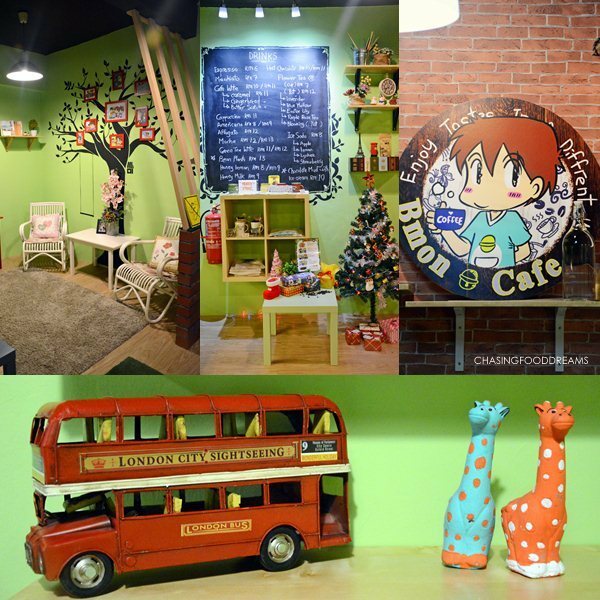 Bmon Café is truly one of a kind! I like their concept and the sheer simplicity of what they serve. Both Roy and Travis obviously made lots of effort in the décor. It’s a perfect place for hangouts, fun parties and certainly a good place for dessert and drinks! 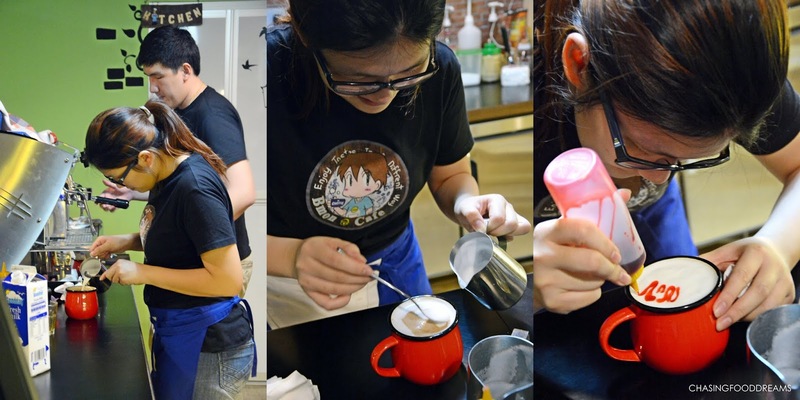 Plus points for Bmon Café include 10% discount for students and there is no service charge.